You can now use Pokemon Bank with Pokemon Sun and Moon, as well as the 3DS virtual console's Red, Blue and Yellow remakes. Bank when Pokemon Sun and Moon launched it was missing one key piece of functionality: compatibility with Pokemon Bank - the tool that allows players to transfer Pokemon from old Pokemon titles. Today, an update for Pokemon Bank has gone live, enabling functionality with both Sun and Moon and the 3DS virtual console remakes of Red, Blue and Yellow. A Pokedex that allows players to see info about Pokemon registered and connected to Pokemon Bank in the National Pokedex. Adventure Records, which allows players to reflect on their past adventures by evaluating their saved data containing interesting figures and stats like the number of Pokemon caught or the number of wild Pokemon encountered. 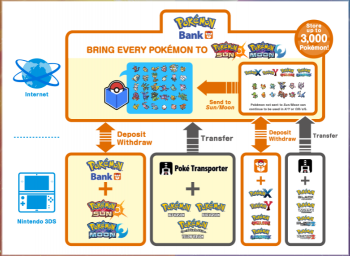 Receive Poke Miles for every Pokemon deposited into the Bank and the length of time they remain, which may be redeemed for Battle Points to be exchanged in Sun & Moon for various items. Finally, as an added bonus, from January 25 to October 2, 2017, anyone who uses Pokemon Bank to transfer a Pokemon to Sun and Moon will receive an exclusive Mewnium Z Z-Crystal, that cannot be obtained in the normal game. Give the Mewnium Z to a Mew which has learned the move Psychic, and you'll unlock the powerful Z-Move Genesis Supernova. If you weren't already aware, Pokemon Bank requires an annual fee of $4.99 to use. Nice update since I get to play around with my Gen 1 team (hell yeah Mewtwo with Tri Attack!) but a bit rude that they don't actually give us a Mew to go with the Mewnium Z, especially considering that any Mews obtained through Gen 1 glitches are (apparently) unavailable for transfer. At least the Celebi gift at launch could be transferred around after it expired, so... yeah, little luke-warm on the Mewnium Z at the moment. I should check it out though. Finally, I was wondering if they were going to get it out by the end of the month. Tonight, my 700+ population on OmegaRuby can say goodbye to their old home.